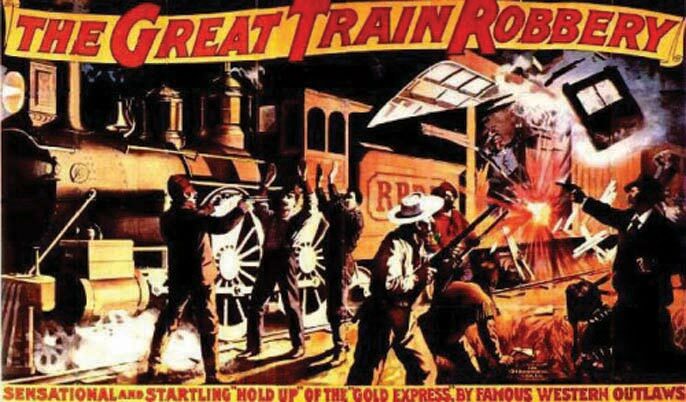 Today’s post is a continuation of last week’s essay concerning Edwin S. Porter’s landmark 1903 production of The Great Train Robbery and the subsequent career of its star “Broncho Billy” Anderson. 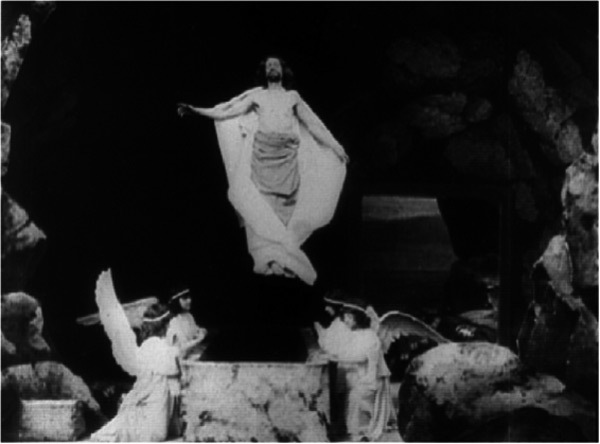 One of the side effects of the film’s popularity was that other filmmakers immediately began to copy its techniques (one even remaking it shot for shot) as well as individual moments: train robberies, fights on top of trains, and scenes of men being made to dance by having their feet shot at soon became standard conventions of the genre. Another side effect was that everyone associated with the film found themselves in demand for future motion picture productions. 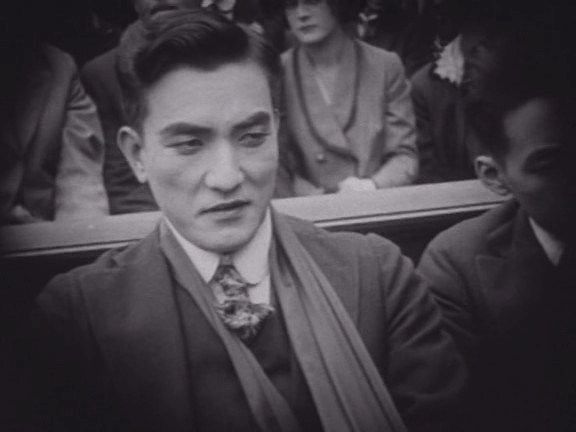 Although The Great Train Robbery, like all movies of its era, does not feature credits, a movie star was nonetheless born: Anderson, who played three different roles in the film (a robber, a train passenger who dies a spectacularly melodramatic death and the aforementioned man who is “made to dance”), would change his moniker again, this time to “Broncho Billy” Anderson, and become the cinema’s first true cowboy star. 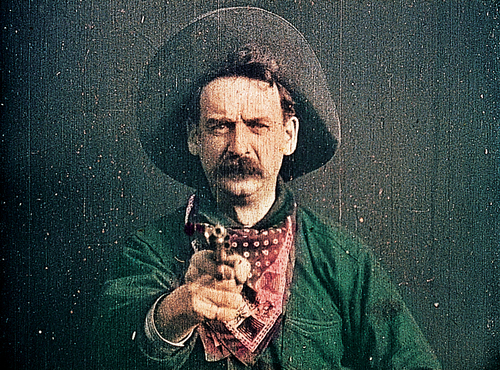 Historian Kalton C. Lahue notes that it was both ironic and fitting, given the “make believe” nature of the movies, that its first western star was born with the “unlikely” (and, though Lahue doesn’t say it, Jewish) name of Aronson and that, at the time The Great Train Robbery was made, he couldn’t ride a horse and had never travelled “west” of Chicago. This irony is precisely what Clint Eastwood had in mind when he directed and starred in the poignant and highly personal 1980 comedy Bronco Billy, the fictional story of a New Jersey shoe salesman who decides to become the headliner of a modern day “Wild West show.” In an age of mechanical reproduction, long after the west had actually been settled, the story of the real Broncho Billy must have resonated with most of the “authentic” cowboy stars that followed in his footsteps. 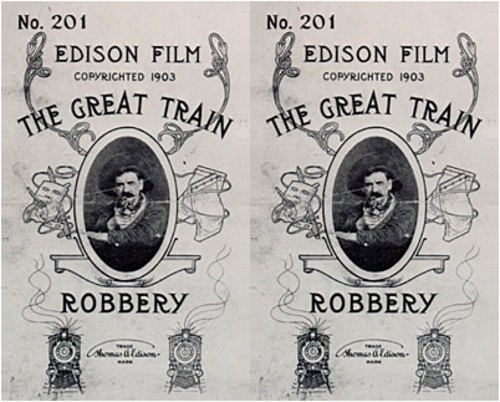 Following The Great Train Robbery, Anderson starred in three more Edison westerns in 1904 and 1905 (Western Stage Coach Hold Up, A Brush Between Cowboys and Indians and Train Wreckers), all of which provided variations on the basic formula of their first big hit. But Anderson had his own ideas about what constituted “western authenticity” and wanted more creative control. 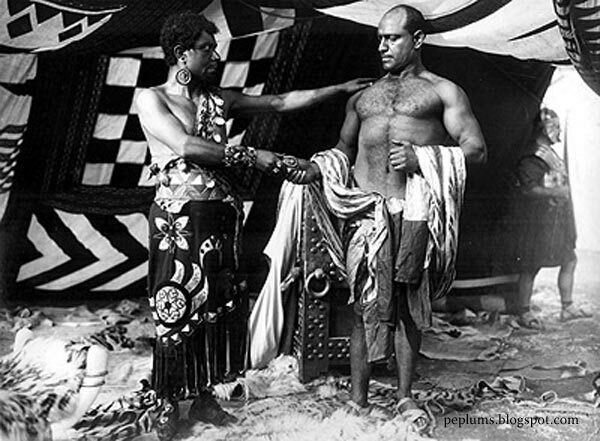 In 1905 he left Biograph to work for their chief competitor Vitagraph. It was there that Anderson directed his first film, Raffles, the Amateur Cracksman. 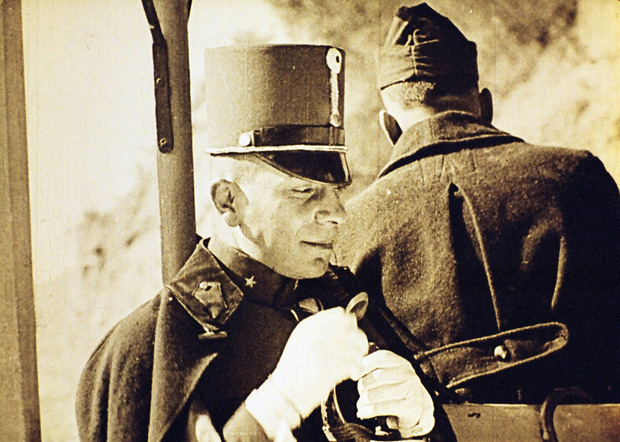 The financial success of Anderson’s directorial debut led to an offer the following year by Colonel William Selig, who was willing to allow Anderson to both direct and star in his own movies. After making a few Chicago-shot shorts, Anderson convinced Selig to allow him to shoot a series of westerns and “stunt comedies” on location in Colorado. All of these were released in the spring and summer of 1907 and boosted Selig Polyscope’s profits considerably. (Of these, His First Ride and The Bandit King still exist today as fragments). Anderson and Selig, however, were not a good fit. Anderson thought his brief but successful run at Selig Polyscope meant that he deserved more money but Selig thought differently. Anderson quit. Upon returning to Chicago, Anderson met George Spoor, whose Magniscope projector had made the inventor a fortune. 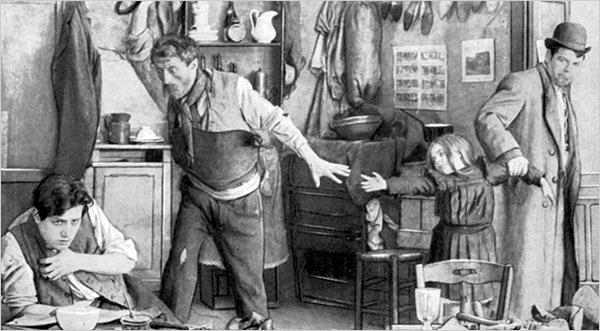 In a 1915 interview with Motion Picture Magazine, Anderson recalled convincing Spoor to start a Chicago-based studio that would rival the Selig Polyscope Company. According to Anderson, the agreement was that Spoor would put up the cash and Anderson would do “the work.” In the summer of 1907, they incorporated as The Peerless Film Manufacturing Company, setting up headquarters at 496 N. Wells Street (1300 N. Wells in modern numbering). Just as Spoor and Anderson were getting their new company underway, Thomas Edison was implementing a “licensing system” that would maximize the profits from the many motion picture camera and projector patents he owned. 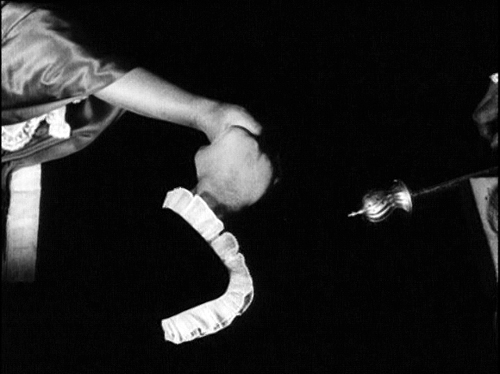 Soon, Selig, Spoor and Anderson and most of the nation’s other major studios (Kalem, Pathe Freres and Vitagraph) joined forces with Edison to form The Motion Picture Patents Company (also known as the MPPC or Edison Trust) in something of a Faustian bargain. 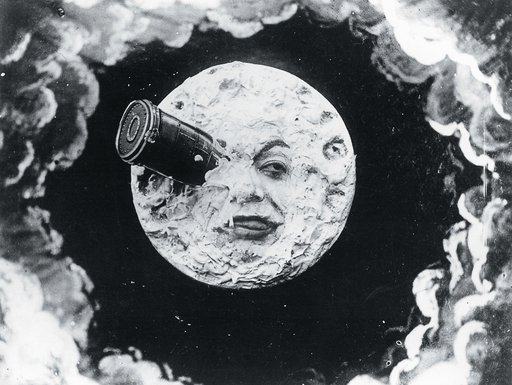 This trust would control the industry for a decade by suing any motion picture producers who used cameras that allegedly violated Edison’s patents – but it also inadvertently opened the door to new innovations in filmmaking and became one of the reasons why southern California would ultimately become America’s filmmaking capital. 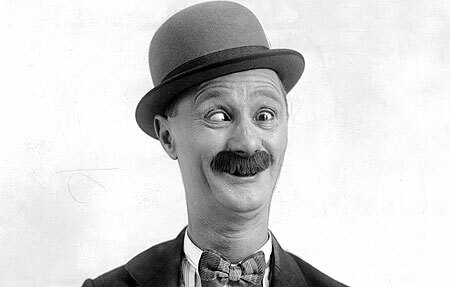 Anderson and Spoor recruited their cross-eyed janitor, Ben Turpin, to star in their first movie, the Anderson-directed stunt-comedy An Awful Skate; or, The Hobo on Rollers. The scenario, reminiscent of His First Ride, features Turpin crashing into things while roller-skating down Wells Street. The scenes may have been staged, but there was little acting involved – Turpin had no idea how to skate. 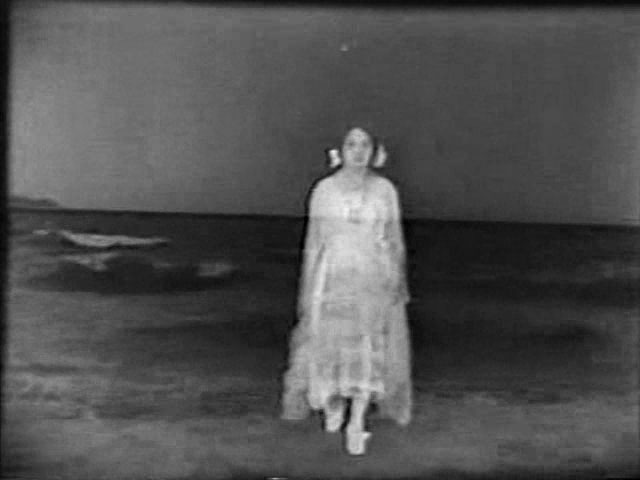 Produced for only a couple hundred dollars, it has been estimated that An Awful Skate made between five and ten thousand dollars in profits in spite of the “bootleg situation.” The new influx of cash saw the studio change its name and move into a much larger complex of buildings on the city’s far north side. Rechristened Essanay Studios (a phonetic spelling of the first letters of the names of Spoor and Anderson – “S an’ A”), the studio opened for business in earnest in early 1908 at the address of 1333-45 W. Argyle Street in Chicago’s Uptown neighborhood (St. Augustine’s College today). The rivalry between Selig Polyscope and Essanay was on – but that will be the subject of another post. 1. Brownlow, Kevin. Hollywood, the Pioneers. New York: Knopf, 1979. Print. 2. 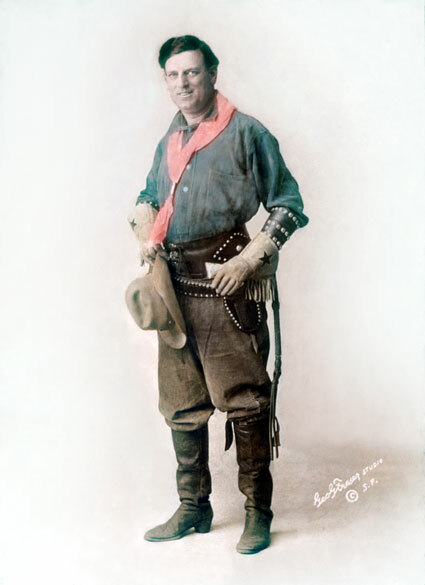 Lahue, Kalton C. Winners of the West: the Sagebrush Heroes of the Silent Screen,. South Brunswick: A.S. Barnes, 1971. Print.